Designing a new 911 GT2 requires a new approach to old ideas. It means questioning convention, crossing the limits, thinking beyond the norm. It means not being confined to road or track, straight or bend, comfort or sports performance. It means having the freedom to leave what you know and examine new possibilities. The result: the most powerful road-going 911 ever made. The source of that power is a 3.6-liter flat-six boxer engine based on the current 911 Turbo. Special features include VarioCam Plus and twin turbo-chargers with Variable Turbine Geometry (VTG) enabling faster response at lower engine speeds. Together, they generate even greater power: a mighty 530 hp at 6,500 rpm. Performance and efficiency have both been improved, mainly through changes to the turbo-charging system. The flow-optimized turbines and compressor units have been specially adapted to the engine output and offer a more effective turbocharging process. In addition, the new model has an ‘expansion’ intake manifold – a totally new technology that is radically different to the existing induction principle for turbocharged engines. Another improvement is the higher rate of exhaust flow through the new main silencer – now made from ultra-lightweight titanium. Rear-wheel drive provides driving dynamics that are similar to those of a racing car. The lightweight build keeps the overall weight low for a power-to-weight ratio of 5.99 lbs/hp. For some, that number means little on paper -but it all becomes dear on the road. 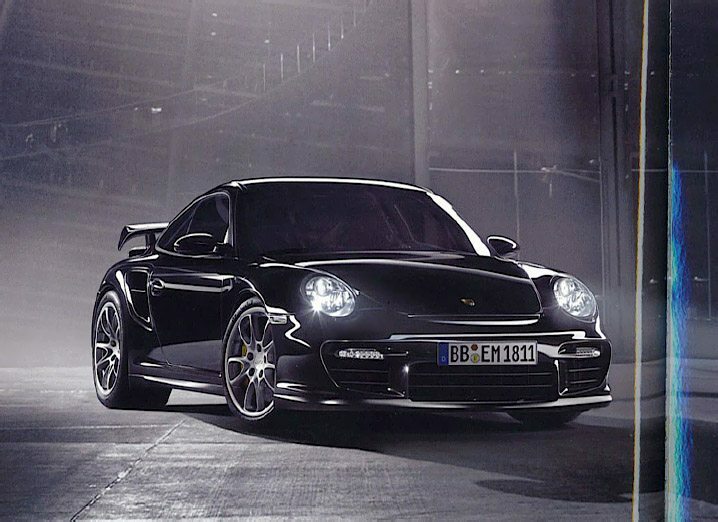 With a driving experience – and an engine sound – that can only be conceived in the Porsche 911 GT2. Aerodynamics is the study of forces generated on a body in flow. With the new 911 GT2. we’ve even questioned that: it doesn’t have to move to take your breath away. The most impressive view is also the one that others will see most of all: the rear. The fixed rear wing with integral lip spoiler ensures optimum stability at speed. As the car accelerates and you’re pressed into your seat, air is forced through the intake openings on the rear wing uprights and into the engine turbo-charging system. This ‘ram air’ effect has a key role to play in the exceptional efficiency of the engine. Since air is already being forced into the turbos, there is less resistance from the compressors and therefore less back-pressure in the exhaust, which means greater engine performance. The engine cover, featuring the GT2 logo, is made from lightweight glass-liber reinforced plastic (GRP). Twin titanium tailpipes are elegantly incorporated within the rear apron design. Warm air is vented from the engine compartment via cooling slits at the rear. fuel capacity 66.99 litres or 17.7 gal.